August 13, 2015 by Michelle M.
Nicki Clements is utterly incapable of making a good decision, even when it is life threatening. That’s why she’s a Woman with a Secret in the novel by Sophie Hannah. She’s been having a secret online relationship with someone she knows only as Gavin, but there is far more to it than that. She wants to be a good mother, and she loves both her children Sophie and Ethan and her husband Adam. She’s just not capable of finding enough in her life as it is and has to find someone, somewhere to spill her secrets. Unfortunately, in the same town, a famous newspaper columnist has been brutally murdered, and Nicki’s suspicious actions as the police are investigating outside his home – which happens to be on her way to her children’s school – cause her to be drawn into the investigation. And since she can’t make a good decision, of course she lies to the police about her actions, even though they – we believe – had nothing to do with the murder of Damon Blundy. As the police investigate, the husband in charge of the case tasks his wife who is on another duty with unofficially running down leads and investigating. They are both raw characters, as well – impatient, rude, and arrogant in many respects, but finding the truth is still what drives them in the end. The thriller races along with no character that you truly like. And as odd as it sounds, though I wanted to reach in and shake most of the characters in the novel, this was a book I kept picking up every free moment I had to read “just a little more” because I wanted to see where on earth it was headed. I always think that I enjoy books because I relate to the characters and get in their heads. I root for them and cheer them on. 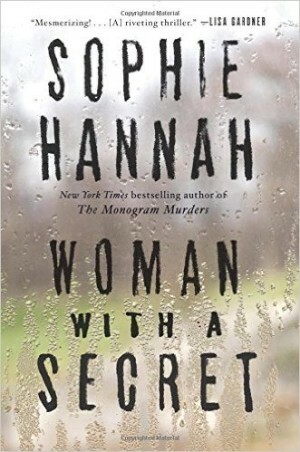 Then I pick up something like Woman with a Secret and realize there is a whole other aspect of books that are just as compelling where the characters can be somewhat repellant and yet still crafted in a way that draws you in. Sophie Hannah has done a fantastic job in creating this second kind of novel. It isn’t one that I would want to read sitting down at the pool to relax, but a psychological thriller isn’t meant to be a light beach read. Through the many plot twists and turns, the true story slowly comes out, and you realize how much bigger the murder of Damon Blundy actually is. The novel flashes between the present and columns written in the past by Damon Blundy, the controversial murdered columnist, and others. This helps explain some of the relationships and antipathy amongst the characters, particularly Blundy who from the start has already been murdered in his home. This knowledge helps explain the motivations that so many suspects have for murdering him – his ex-wives who he’s savaged in his column, a former MP who his columns were partial reason she was forced to resign, an athlete banned for life for doping, the drug using author who he compared with the athlete, another columnist he butts heads with, and more. Sophie Hannah does an amazing job with her character study, leaving no one as the paragon of virtue in any way. And yet the conclusion is satisfying in its own way, as somewhat abruptly as it occurs. Written by Michelle of Honest & Truly! who adores the internet, but not what some do with it. See how she makes her own home on it via her blog Honest & Truly! and on Twitter where she is also @HonestAndTruly. I agree, it is easy to see why we enjoy books with characters we like. Enjoying a book like this makes me question what it is that I’m really liking – it certainly isn’t the characters! But there’s something really compelling about this story and books like it that I just can’t place.